Space agencies of Europe, assemble! 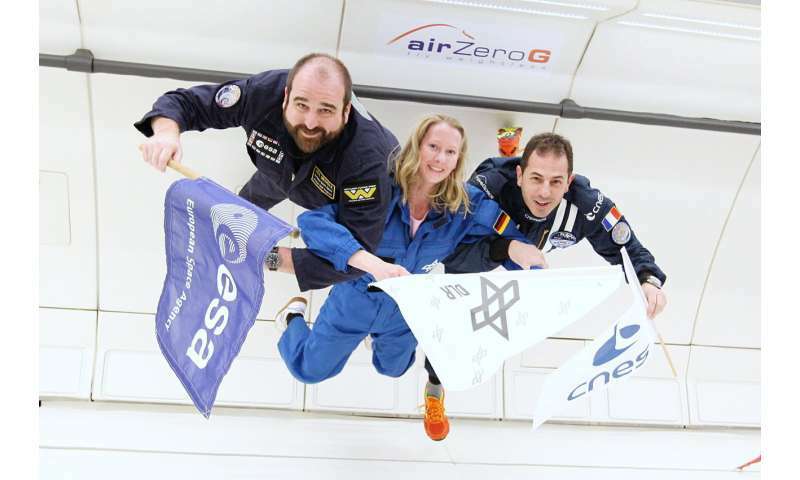 Last week, ESA, the German Aerospace Center (DLR) and French space agency CNES joined forces to run a special parabolic flight campaign entirely dedicated to life science experiments. Between 4 and 7 June, eight experiments were run in three different levels of partial gravity, another first for a parabolic flight campaign. One experiment investigated the effects of partial gravity on brain function. Previous studies have shown that short exposure to microgravity increased neurocognitive functions due to increased blood flow to the brain. However, longer-term spaceflight, in which increased blood flow to the brain is more permanent, showed negative effects on cognition. In this campaign, studying the phenomenon in partial gravity is helping scientists better understand where we draw the line for optimal performance. Parabolic flights are one of a few ways to recreate microgravity conditions on Earth, but how is this achieved? The A310 Zero-G aircraft, operated by Novespace in Bordeaux, France, repeatedly performs a special manoeuvre. After pulling up sharply to 50 degrees, the pilots reduce the thrust and pitch of the airplane to cancel air-drag and lift. This places the plane on a parabolic flight path, exactly as if it has been thrown upwards and released. It then essentially falls over the top of the parabola, creating 20 seconds of 0g. When it reaches 50 degrees nose-down, the plane then pulls out of the descent to normal flight. To achieve partial gravity, the angle at which the plane pulls up and pulls out is shallower, and the pilots carefully cancel out only part of the lift. This creates about 25 seconds of one-quarter gravity, or 35 seconds of half-gravity, or 50 seconds of three-quarters gravity. The manoeuvre is performed every three minutes for a total of 31 times per flight. Watch a tour of the Zero-G aircraft here. "It was a real privilege to work on this unique campaign, not only because of the constructive collaboration with my colleagues from DLR and CNES, but also to provide such an interesting suite of experiments with rare and much-needed data," said Neil Melville, Coordinator of Parabolic flight and Drop Tower campaigns. He is pictured on the left, alongside Katrin Stang of DLR (middle) and Sébastien Rouquette of CNES (right). "We are certainly looking forward to the results the science teams will publish once their analyses are completed, and hope to perform a similar campaign in the future." ESA conducts 0g parabolic flight campaigns twice per year for microgravity research.